I’ve decided to try my hand at Flash game development. It’s always been a dream of mine to make a living at creating games, and Flash games seem to be a viable way for individual, independent developers to earn a living. My first game has just been released, thanks in part to a sponsorship from MiniJuegos.com. It’s a truly global market when a Spanish-language games site headquartered in Spain can fund an English-language game from one guy in North Carolina. Necropolis is a game about Ms. Lilian Trevithick, lady adventurer and radical steam technician, who has come to the infamous Necropolis of Ao in search of adventure. 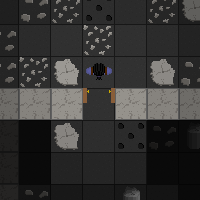 She descends through 25 procedurally-generated levels of traps and treasure to achieve her goal. Please give me any comments, compliments, or criticisms that come to mind playing the game! This is the first game I’ve released in years, so I’m both very nervous and very excited. Your game hung on the transition from level 4 to level 5 and never recovered. I find this annoying. I’m not sure what’s causing it to hang. I’ll look into that. The inability to turn is intentional. I was aiming for a slightly puzzle-y feel, and the movement restrictions mean that the character’s path through a room needs to be more carefully planned and that, yes, sometimes a trap can’t be disabled. This is intended to help prevent disabling from being a universal strategy, so that the Dodge stat cannot be ignored. Overall, it’s not a bad start. The framework you set up is actually pretty good. The fog of dark keeps the game interesting, and though I generally don’t like this style of game, it’s not bad. I don’t mind that some traps are unavoidable – but as noted below, the traps were not my primary enemy. The text choice in the How-to section is difficult to read. Stylistically, I understand the choice, but the irregular font width is distracting. Also, the Black text on a Red button on a black background is also difficult to look at. I am using a CRT, so the white webpage may be ruining my ability to see dark contrasts. The game jammed on level 18, when I tried to open a big chest and the dialog just failed to appear. The game still ran normally, but the dialog was simply inactive, so hitting y/n didn’t help. There was noticeable slowdown when the majority of the screen filled with map in some form or another. I think this is largely Flash’s fault and not yours. Disabling seems to be crippled in comparison to dodging, as I would have more in disable, but would successfully dodge far more often. Moreover, disabling had a much higher likely hood of harming me than running headlong into the traps. Perhaps consider placing the ‘drink’ button a little bit further away from the ‘disable’ button, as I had to use either infrequently enough that I ended up boozing it up wastefully. WRT not turning, that is all fine and good, but generating those sorts of things on the first level is a good way to kill of characters early. If you look at the screenshot, you’ll see that I was in such a situation on level 1 in the room with the first big chest. Also, I think it would make sense to let characters start with 4 health so that the potions are not always being used wastefully until you are lucky enough to find a health-up item. Music is enormous on the Flash scale of things. Sadly. Of course you do! They’re patented health tonics, carefully mixed using the latest chemistry to offer the maximum amount of enjoyment and salutory effect. I had intended for disabling to be safer than dodging, but I just redid the math and they are almost equal, given equal ability, with disabling being a tiny bit riskier. I’ll be putting up an updated version where disabling is ~20% more likely to succeed. I’m not sure where these freezes are occurring; I’ve tested rather extensively. I’ll take another look. 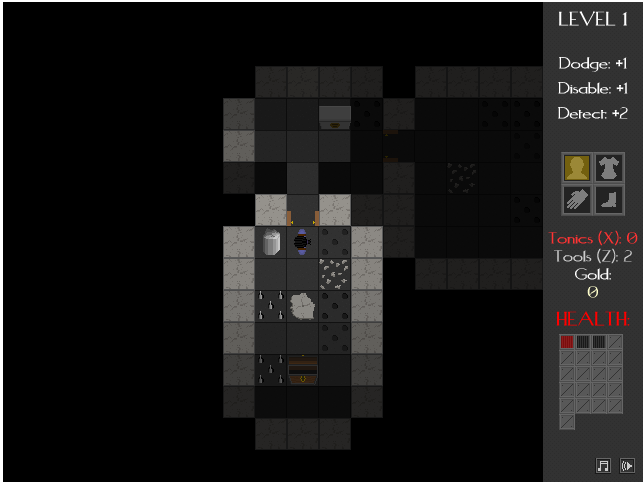 You made a roguelike? I’ll give it a shot when I find a minute. It’s roguelike-inspired, but a purist would claim it’s not one itself; there’s no item identification, no combat, no leveling, and a graphical interface. The end is not scary. If anything, it’s anticlimactic. There’s no risk of being startled in the game except by the normal trap effects. I finished the game seconds ago, it was epic!